I had a girlfriend some years ago, that, among other grating habits, would drop pretentious art school lines like “that is soooo PoMo (as in Post Modern)”. To this day my friends get a kick out of ribbing me by quoting some of her more choice sayings. 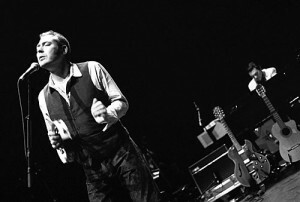 Earlier this March The Tindersticks came through New York and played the Brooklyn Masonic Temple on their short stateside tour supporting their new album. The choice of venue provided a worthy setting for a band with such an effortlessly exuded dapper stage elegance. This show has set a mighty high watermark for best show of the year. Truly incredible. During the show, I thought to myself, I wonder if The National is influenced by this band. If The National age and mature gracefully in a 30 year steady and incremental fashion (and this is no knock on The National), they might end up sounding a bit like The Tindersticks. This is “The Hungry Saw” from the new album of the same name.